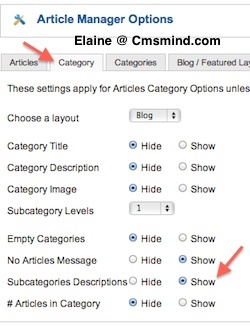 I’ve been asked this question a few times in my previous post about How to Display Multiple Subcategories in Category Blog Layout, but have not really looked into it. Today I went searching for the answer. The question is: How to show the images of a subcategory in Joomla 1.7? I did find a solution and the functionality is already built into Joomla 1.7.3, so there no need to install additional Components or Extensions. This post is created in response to Edward, Boris and Roula. Sorry for the delay. I changed my ‘Home’ link to a menu item to list all categories and subcategories to show images. The screenshot on the left is the result of the change. If this is what you want to accomplish, I’ve created a few steps below so you can try it as well. Create your own category and subcategory. You can create a subcategory by simply placing it under a ‘Parent’ Category. Below is only an example, replace my data with your own. 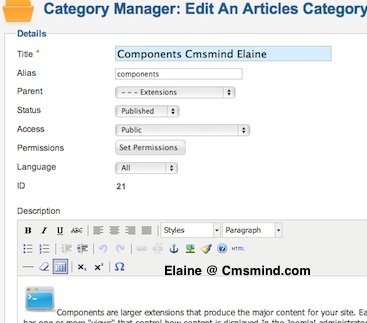 These are the global options to manage your articles and category options. You can override these options if a value is directly specified in the Menu Manager. You need to change the options in 2 tabs – Category and Categories. You can use any menu item to show categories. You can use the Menu Item type = List all Categories, Category List, or Category Blog to show Subcategory images. Remember to select the Parent of the subcategory as the ‘Select a Top Level Category’. Below is just an example, remember to modify the details to your own Joomla 1.7 website. 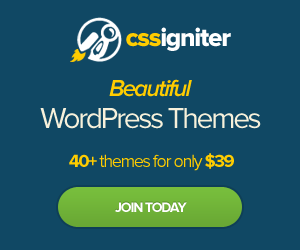 Refresh your website and try out the Menu link. Remember that your Menu must be published in the Module Manager as well for it to be seen on the Frontpage. Once you click on the ‘Home’, you should see a list of categories and all your subcategories with images and descriptions beside them. Unfortunately I get a list of all the articles, paginated, at the bottom a list containing links to all the subcategories. Additionally, setting the blog to use multiple columns for the articles is completely ignored. Any ideas what magic combination of settings would show like this? Did you ever find out how to achieve this? I’m looking for the same thing. You would thing if you are going to list a category with several sub categories that the Title for those subcategories would be better placed at the start of its respective items rather then all at the bottom of the entire list of articles. 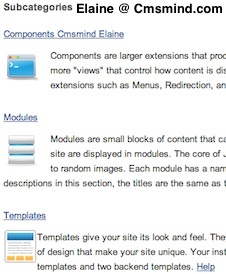 I’ve been looking for a way to do this as well…in Joomla 2.5. Did you ever come up with a solution?